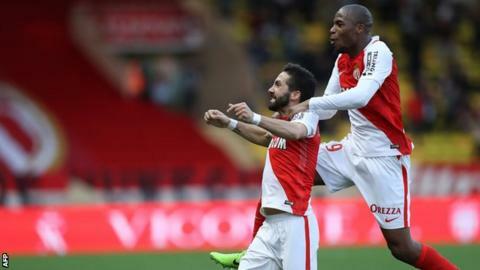 Monaco opened up a five-point lead over second-placed Nice at the top of Ligue 1 with victory over Bordeaux. Kylian Mbappe slotted home on 68 minutes, before Joao Moutinho found the top corner with a wonderful curling effort from outside the box just six minutes later. A mistake by Monaco goalkeeper Danijel Subasic allowed Diego Rolan to pull a goal back for Bordeaux on 84 minutes. Monaco host Manchester City in the Champions League on Wednesday. They trail 5-3 from the first-leg in the last-16 tie. Leonardo Jardim opted to leave top-scorer Radamel Falcao on the bench, but they needed his help to break the deadlock as he set up 18-year-old Mbappe's 10th league goal of the season, shortly after coming on. But the Colombia striker departed late on clutching his ribs after a heavy challenge from Bordeaux defender Nicolas Pallois. Nice's draw with Caen on Friday moved them above Paris St-Germain into second place on 63 points. Unai Emery's third-placed PSG side will hope to bounce back from their 6-1 midweek defeat by Barcelona as they were knocked out of the Champions League, when they face Lorient on Sunday. Match ends, Monaco 2, Bordeaux 1. Second Half ends, Monaco 2, Bordeaux 1. Attempt missed. Tiemoué Bakayoko (Monaco) right footed shot from the left side of the six yard box misses to the right following a set piece situation. Delay in match Falcao (Monaco) because of an injury. Nicolas Pallois (Bordeaux) is shown the yellow card for a bad foul. Foul by Nicolas Pallois (Bordeaux). Foul by Diego Contento (Bordeaux). Hand ball by Falcao (Monaco). Milan Gajic (Bordeaux) is shown the yellow card. Jérémy Menez (Bordeaux) is shown the yellow card for a bad foul. Goal! Monaco 2, Bordeaux 1. Diego Rolan (Bordeaux) right footed shot from the centre of the box to the centre of the goal. Attempt saved. Adam Ounas (Bordeaux) left footed shot from outside the box is saved in the centre of the goal. Assisted by Diego Rolan. Substitution, Monaco. Tiemoué Bakayoko replaces Bernardo Silva. Offside, Monaco. Nabil Dirar tries a through ball, but Kylian Mbappe is caught offside. Diego Rolan (Bordeaux) wins a free kick in the defensive half. Substitution, Bordeaux. Adam Ounas replaces Malcom. Substitution, Bordeaux. Jérémy Menez replaces Valentin Vada. Substitution, Bordeaux. Diego Rolan replaces Gaetan Laborde. Goal! Monaco 2, Bordeaux 0. João Moutinho (Monaco) right footed shot from outside the box to the top left corner. Assisted by Bernardo Silva. Goal! Monaco 1, Bordeaux 0. Kylian Mbappe (Monaco) right footed shot from the centre of the box to the centre of the goal. Assisted by Falcao following a corner. Corner, Monaco. Conceded by Igor Lewczuk. Attempt missed. Jaroslav Plasil (Bordeaux) left footed shot from outside the box is close, but misses to the right. Substitution, Monaco. Falcao replaces Thomas Lemar. Offside, Monaco. Thomas Lemar tries a through ball, but Valère Germain is caught offside. Attempt missed. Francois Kamano (Bordeaux) right footed shot from outside the box is too high. Assisted by Jaroslav Plasil. Attempt blocked. João Moutinho (Monaco) right footed shot from outside the box is blocked. Assisted by Bernardo Silva. Offside, Bordeaux. Valentin Vada tries a through ball, but Francois Kamano is caught offside. Attempt missed. Kylian Mbappe (Monaco) right footed shot from the left side of the box misses to the right following a corner. Attempt blocked. Kylian Mbappe (Monaco) header from the centre of the box is blocked. Assisted by Thomas Lemar with a cross.